Spoiler Warning! 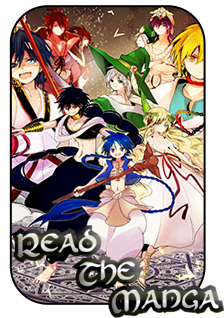 Do not read if you have yet to read the latest Magi Chapter! I'm surprised at how many new age concepts(which are mostly just a melting pot of ancient concepts) are being used to explain Magi's world. But what I really loved about this chapter was the trolls and how they were harvesting humans with sap on giant sticks. It was nice to b able to see all the Djinn before they were Djinn, especially Ugo! But come on already, just tell us the big deal Aladdin! Magi does a great job of mixing serious scenes with hilarious antics. It's one of the things I appreciate most about the authors writing style. The "Don't look at me..." comment from the pig household member was certainly all too perfect. Still, I agree this is leading into the next arc. I'm really curious to see where things go from here as it could branch in a number of directions depending on the decisions of the leaders currently present in light of all this information. Kouen seems like he's got a hard on because this is all sort of supporting his ideal that there should only be one king. Mu is being ambiguous and it's hard to say what he'll do...but I think he will consider Reim's interests over the worlds so he might not help Aladdin either.